High in a forested residential area overlooking Monterey Bay, this home has a welcoming vibe from the moment you open the front door. The sky lit living room, decorated in warm Earth tones, features a sectional, two leather swivel chairs, large TV, fireplace, and a Yamaha piano. Sliding doors lead outside to a multi-level deck and a private fenced yard with ferns, azaleas, roses and trumpet vines. The kitchen has brick-colored concrete countertops, a four-burner gas range, maple cabinets, stainless appliances, and a Spanish tile backsplash. The dining table (with an extra leaf) seats 6-8. Steps up from the living room there’s a full bath with a small tub/shower and a hand painted vessel sink. Across the hall, a den with a convertible desk/wall bed overlooks the living room (with a pulldown blind for visual privacy). The master, decorated in a soothing shade of blue, has a small, modern en suite bath with a white tiled shower and a vessel sink. The third guest room, across the hall, has a sleeper sofa and a large TV. 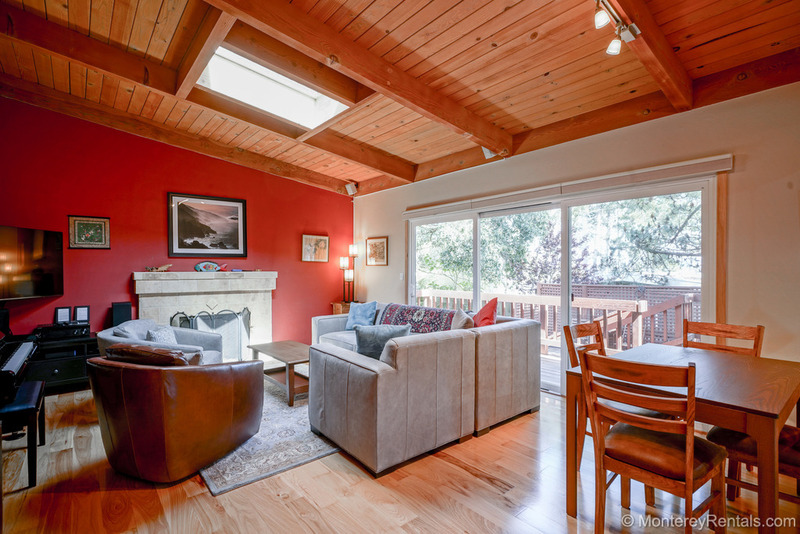 With easy access to Highway One and 68, this home is perfect for commuters—and close to everything on the Monterey Peninsula. Second guest room overlooking the living room doubles as an office with a fold-down wall bed/desk.